We offer fruitwood ballroom chairs for our customer’s events. Currently, fruitwood ballroom chairs are the high-end selection of the season. They can be found in five star hotels and exclusive country clubs, and when you see them you can understand why. 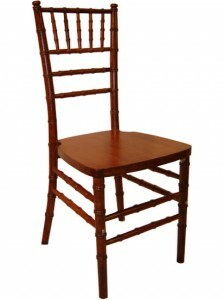 Much like other ballroom chairs, the legs and back are well-turned, ridged wood spindles. Unlike most ballroom chairs, they are a natural-looking, deep reddish-brown color. The look is comparable to real mahogany, red oak, or cherry wood, but at a fraction of the cost. The chairs are also covered with a high-gloss finish, which gives the wood grain the opportunity to showcase it’s natural contrast and beauty.